Learn how to send tracked emails to help you measure open & click rates on your outreach. You’re already familiar with sending tracked emails on Mobile 3.0, Gmail, and in Group Messages. 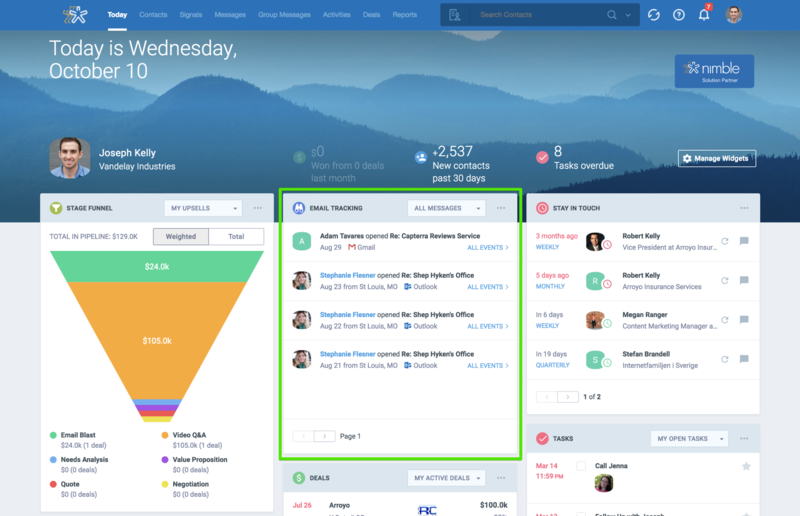 Now, we’re making it easier to send tracked emails from anywhere you work in your Nimble workflow by adding the ability to send tracked emails from the Contact record, Messages tab, and in the Nimble Smart Contacts App. Where can I initiate a tracked email in Nimble? You can initiate a tracked email from anywhere you can send an email in the web app, on iOS (Android coming soon), and in the Smart Contacts App browser extension for Chrome. Where do I see reports on my tracked email outreach? 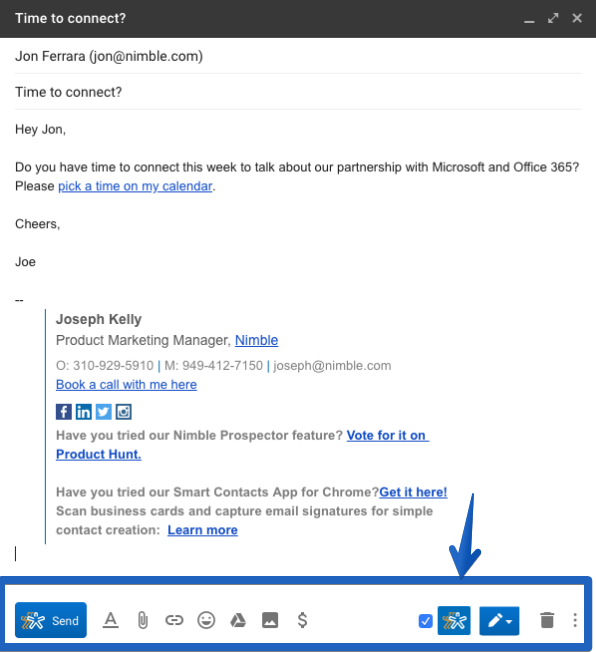 You'll see the results of your outreach on the Email Tracking widget on your Today Page dashboard, on the Email Tracking tab in Nimble Mobile 3.0, and also on the notifications bell in Nimble. 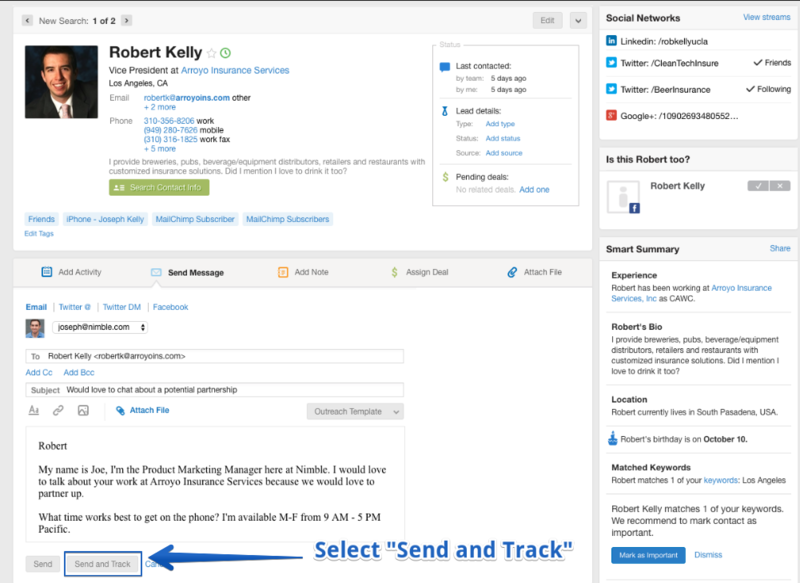 Inside of the Nimble web app, you can select to send and track a message directly from a contact record or in the Messages tab when composing an email. Here's an example from the Contact record. Simply select "Send Message" and choose "Send and Track" when you want to send it out. Over on the Message Tab, select your recipient, compose your message, then select "Send and Track". We know that you're not always working out of the Nimble web app, which is why we added the ability to send messages with tracking enabled from the widget. Common places to compose an email with tracking would be on social networks like Twitter, LinkedIn, Facebook or while visiting a company website. If you don't have the contact email for a prospect you're profiling, use our Prospector feature to discover their email and then hit send with tracking enabled. 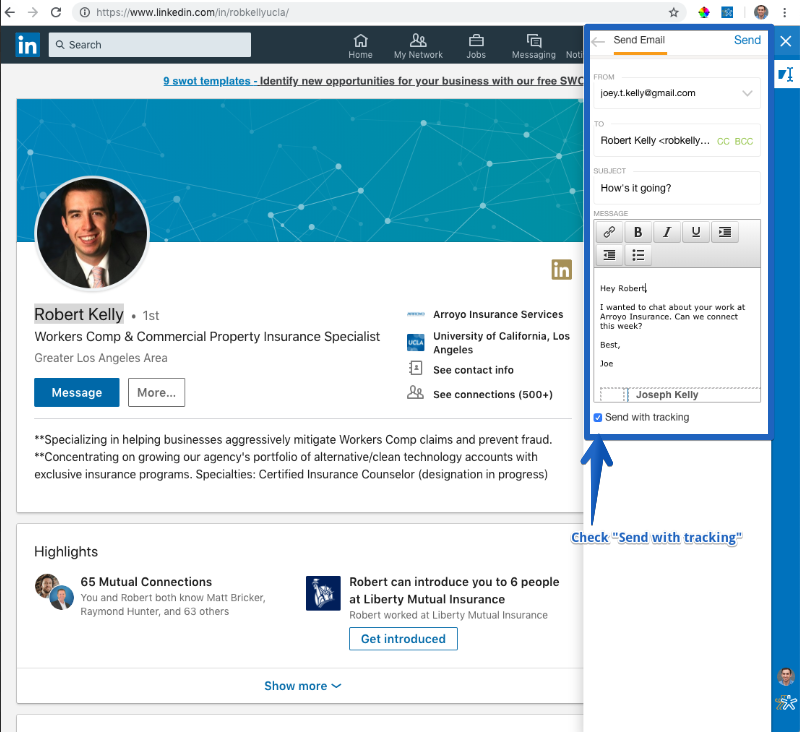 Above is an example of sending a tracked message from LinkedIn. Select "Send with tracking" before you send your message and the report will sync back to Nimble. If you aren't already familiar with our workflow in Gmail, you may also send a message with tracking enabled by checking the "Nimble" box to send with tracking. Learn more on our separate FAQ. 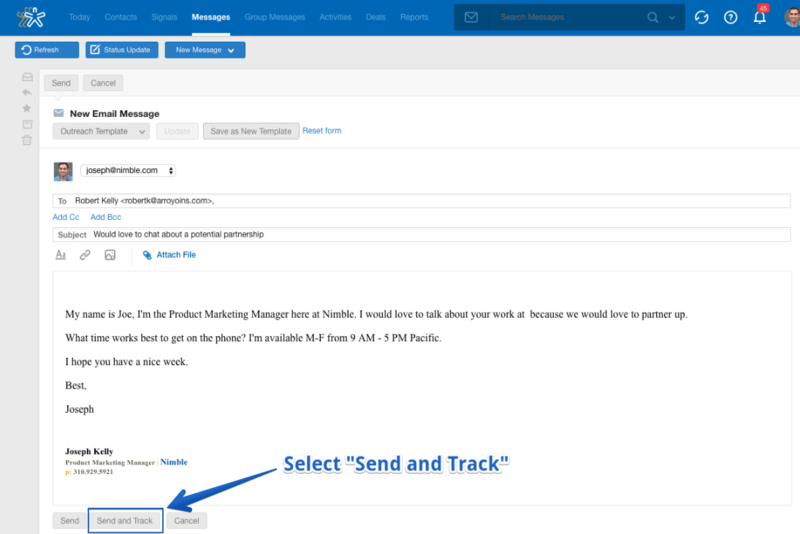 If you weren't aware, Nimble Mobile 3.0 now lets you send, track, and measure email engagement on the go! Here's an animation of the workflow on our Nimble iOS app. Read more on our FAQ. Once you get the hang of sending emails with tracking, you'll need to understand how to best track the results of your outreach. We recommend adding the Email Tracking widget to your Today Page dashboard to see the results of your engagements front-and-center. Learn more on our FAQ. All of your email tracking history is available to review in the "Email Tracking" tab on Nimble Mobile. Simply select "More" to pull up tracking history for all Individual and Group Messages. Learn more on our FAQ.